Today we’re travelling back in time to visit the Great War’s biggest gun of 1917: the Lange Max (or the Long Max in English). 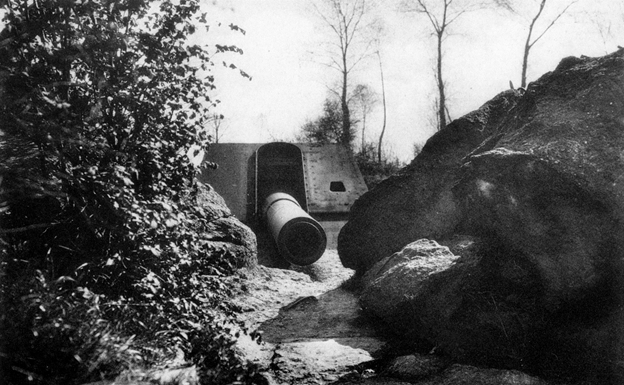 Officially named “Battery Pommern”, this German gun, located in Koekelare in the ward called “Leugenboom”, bombarded Dunkirk (approx. 45-50 km far away!) and Ypres with grenades that had a maximum weight of about 750 kg. About 200 kg gunpowder was needed to fire a grenade. 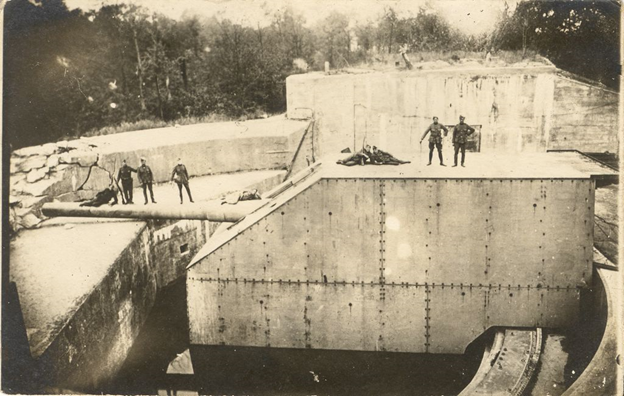 In World War II the Germans melted the gun to get iron and steel, but you can still visit the artillery platform – an attraction long before the museum was created. During the interbellum (the interwar period between the end of World War I and the beginning of World War II) lots of famous people visited the location, including King Albert I, Winston Churchill, and Hirohito, the Emperor of Japan. The Lange Max Museum is telling unique stories of World War I in Belgium. The museum opened in 2014 and provides information is four languages: Dutch, German, English and French, with audio guides in Dutch, English and German. 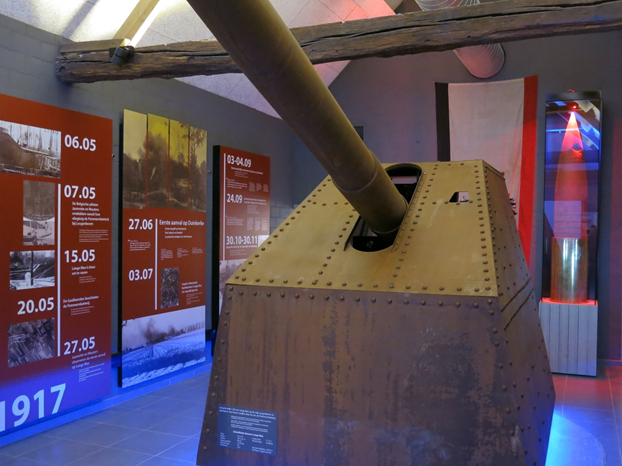 Situated on the German side of the Western Front, the heritage site “Lange Max” also includes the historical artillery platform and a small bakery. The farmyard is the center of this cultural location. A long lane takes you from the farmyard to the remains of the artillery platform of the former German cannon “Lange Max” (in English “Long Max”). In a brand-new contemporary museum, visitors learn all about the largest cannon of its time that was designed to bombard Dunkirk. 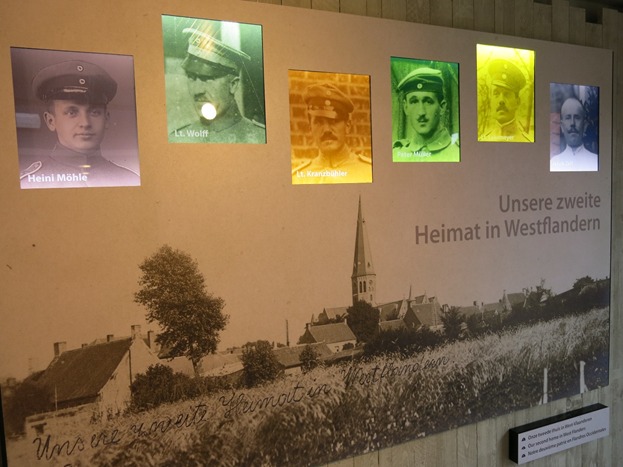 The museum focuses on the German occupation of Koekelare with a unique exhibition about the organization behind the frontline and the production of army goods. Back then, Koekelare with its engineer park was an important war supplier, producing materials like barbed wire and grenades. The little Bakehouse, which still contains traces of the German presence, is now converted into a multimedia room. After the visit, you can relax on a cozy terrace while enjoying a “Kanonbier” or homemade pancakes from the Cafeteria. The site is also the ideal setting for a nice hiking or cycling trip. In addition to its own “Long Max” walk, there are numerous bicycle routes that pass along the site. Ready to celebrate International Museum Day 2018?